Cardiologists spend their days advising patients and changing lives. The current climate for cardiologists includes increasing costs for their practice and lower reimbursements. With challenging financials, cardiologists are faced with keeping their practice full to maximize profits and grow their business. Is your cardiology practice searching for better marketing ideas, website development/design to increase the number of patients you have? Technology is playing a pivotal role in cardiology practices now, with nearly half of all cardiologists prescribing apps to their patients. Likewise, technology and digital marketing and advertising will play an essential role in how cardiologists spread the word about their practice. This guide will help cardiologists in developing a marketing, advertising and SEO plan to attract and book new patient leads. Here are the high points of what we’ll cover. If you’re ready to start growing your cardiology business, read on for details on how to maximize each part of your outreach efforts. To bring in more patients to your practice, you need to build awareness for your business in the marketplace. You need to be on the right platforms and active so that you can more easily be found. Inbound marketing is the methodology of bringing in new patients through valuable content. Your goal in inbound marketing is to answer a question or serve a need. If you can do this, you’ll be there for your potential customers when they need you, which means they’re much more likely to choose you when it comes time to make a health care decision. In addition to inbound marketing, you can also use traditional marketing, such as TV and radio ads to bring in more patients to your business. Just because digital marketing helps answer a customer’s question does not mean that traditional marketing has no worth in your marketing plan. So here’s a step-by-step look at how to use marketing to its full advantage to have a 100 percent booked schedule. Search engines are powerful marketing tools. Whether a potential patient is in the earliest phases of choosing a cardiologist and doing some preliminary research or validating their decisions, you want to be present on search engines to give yourself the best chance of winning their business. Local search is the art of appearing in results for searches of cardiologists in your area. It includes many tactics to help you rank for your community. Here are some areas of interest for improving your local search ranking. Google My Business will only help your rankings on Google search engine, but this is still a worthwhile task and is quite simple. Entries for Google My Business show on a map right after the ads related to a search. This is prime real estate that you don’t want to pass up when it comes to your search engine strategy. If a listing already exists for your business, you just have to claim it and then verify your address by receiving a postcard in the mail with a custom pin that you'll enter online. Search engines are smart, but they still need a little help sometimes. You can provide them the assistance they need by ensuring that your address is consistent everywhere that it is listed online. When your address is consistent, it's easier for search engines to relate all entries back to your business. Create a document that lists out the contact information for your company just the way you want it to appear throughout the web. Then, whenever there’s a listing for your website, copy and paste the information from your master document. Online reviews help give greater confidence to potential patients that you are a good choice for a cardiologist. Reviews don’t have as much bearing on where you appear in local search, but they are still important because they make you stand out from your competitors in a lineup. Encourage your patients to leave you a review on Google after a visit in your follow-up email or text message. That small nudge can be all it takes to start getting reviews that you can then use in other areas of your marketing as well. Backlinks are an essential aspect of search engine optimization. Having other websites link to you shows your reputability to a search engine. It's like a friendly referral that tells the search engine what your content is and why it's relevant. You want to be careful though to seek out strong links to your website as websites that aren’t reputable can look spammy and suspicious to a search engine. So seek out listings of your company on trusted sites, such as your local chamber of commerce, and remember to use that document for a consistent listing of your business information. Ultimately, your online footprint all links back to your site. If your website isn't optimized, your other efforts won't be as impactful. For local search, ensure that your address is listed in the footer of your website and matches what you've listed on third-party sites. Write relevant articles about cardiology in your community. This way, you can use your city name naturally in the text to provide further pages with your city and the term cardiology together. Social media is a great way to show a little bit more of your personality. Your other marketing tactics don’t have the same ability to get personal with patients and potential patients. On social media, you can share what you do in the community, who your staff is and why it all matters. Each platform has its strengths though that the more you know, the more benefit you can gain from them. Here's a look at what each platform is used for. Instagram was built with the concept of sharing visual content with followers. As a doctor, it might seem impossible to come up with visual content for what you do, but it's entirely possible. Dr. Sahni creates custom graphics to share to get her message across. One such graphic reads “love yourself enough to live a healthy lifestyle.” She shared this in relation to heart month. Another aspect of her Instagram profile that is well done is that she shares her speaking engagements and articles she has written to stand out from her peers. She shows her office work. Social media can be difficult because you can’t show your patients due to HIPAA rules, but she has photos of herself in the office so you can feel comfortable with her as your doctor. Facebook is fantastic for sharing visuals and thought leadership through helpful articles. To help illustrate what a strong Facebook strategy looks like, let’s explore a cardiologist page on Facebook. Stats in graphics: sort of like mini infographics, turning a statistic into a graphic makes it eye-catching and draws the reader in. Staff announcements: Jackson Heart shares staff birthdays and achievements, so you feel more connected with them. Highlighting staff on social media is also beneficial because it makes them feel special and recognized. Regular postings: you want to look active on social media to bring in engagement. Have a plan before launching your page to post on certain intervals to keep your page fresh. Jackson Heart posts a couple of times per week. Shapchat can make your cardiology practice look hip and advanced. There isn’t a ton you can do with Snapchat organically, but there are ad opportunities. Plus, you can create a Snapchat filter that is available to people who are visiting your practice so they can share with their friends where they are. Your Snapchat filter can be less serious than some medical situations for cardiology. Focus more on the lighter side of heart health. Pinterest enables users to save content based on categories. These boards make it easier to hang on to what interests you. The Mayo Clinic has found ways to leverage Pinterest as a marketing tool. They have a cardiology board dedicated to heart health information. From helpful links to engaging graphics, their board is filled with interesting facts and figures on the topic. Each piece of their content features an engaging image and a link out to learn more about the heart topic being discussed. Their posts have at least a half dozen pins from users saving the information for later. Reputation management is an essential aspect of your online persona. It factors into your local search strategy because it provides context and information for prospects who visit your Google My Business listing. It doesn't necessarily have a significant bearing on where you rank on the page, but it can sway who chooses you. When practiced well, reputation management can give prospects the feeling that you’re there for them and ready to help when needed. Negative reviews can keep companies from ever even listing their business online, but it shouldn’t because a reputation management strategy can offset those reviews. You should be monitoring what customers are saying about your online and responding accordingly. Let’s take a look at an example. “Hi Christian, We appreciate you taking the time to provide your feedback for Mount Carmel Columbus Cardiology Consultants. Would you mind filling out our Patient Feedback Form (https://www.mcmg.mountcarmelhealth.com/contact-us/patient-feedback) or call 614-643-1388 so that we can look into this issue further? Thank you. Notice the willingness to make it right? But they're also documenting the issue correctly as they can't gather that information publicly on Google reviews. So, they're acknowledging the problem, taking steps to make it right and publicly showing that they are in their patient's corner when things go wrong. On positive posts, they thank the patients for sharing their experience, choosing Mount Carmel for their health care needs and leaving a review for others to learn more. All in all, it’s a good reputation management strategy because it’s responsive and caring toward patients. In some cases, negative reviews might be falsified or targeted at hurting your business. In those cases, you can have the reviews removed. Up to this point, we’ve covered many digital marketing strategies to help you get your business out there. While digital marketing tends to get a ton of air time in the current marketing environment, print marketing still has its place. Print marketing can help reinforce what you’re sharing in your digital marketing, in office conversations and phone calls with patients. Just like digital marketing, each type of print marketing has its strengths. Let’s review how to use the most popular print channels. Postcards are an excellent way to reach patients via mail because they aren't hidden behind an envelope. They invite the recipient to read them when they open their mailbox or are flipping quickly through what they received that day. Postcards are also less expensive for postage, which is great for your marketing budget. This print mailing piece is nice to try and get patients to return to your practice. If they're overdue for a checkup or you merely haven't served them in some time, this is an excellent way to remind them that you're still there and ready to help whenever they need you. To make your postcard mailing trackable, use a unique email address or web address on your mailing. That way you can tell that those people solely came to you thanks to your postcard so that you know if you should keep sending postcards. Mailers are much like postcards in that they are delivered to a patient or prospect as a reminder of your practice. Generally, mailers are more expensive and more involved as far as design and printing costs. Though if done well, they can be quite impressive too. Mailers don’t necessarily have to go in an envelope either. They can be folded and sealed shut with stunning designs on the outside. Just like your postcard, make sure that you have a way of tracking the success of this marketing tactic by using trackable contact information to reach your practice. Fliers are fantastic for event marketing because you can easily customize them for each usage scenario. Have a designer create a template for you that uses nice imagery, bold headlines and ample white space. Then you can make minor messaging adjustments based on the audience and often print them in-house or at your local FedEx or Staples store. While you might feel confident enough to create your flier, it's best to have a professional start you out with a template. Fliers are tempting to fill with information. But then your recipients will feel overwhelmed and not want to read them. Professionals know best practices for copy length on such marketing materials. Your local newspaper can help you reach your neighbors. Generally, your ads will be black and white so think through how your messaging will look in that format and adjust it accordingly. You can’t take an online or magazine advertisement and just re-run it in a newspaper because the format is very different. Keep your graphics simple since the lack of color will make them harder to decipher. Use bold statements and text to draw your reader in and make them interested in what you have to offer among a bunch of other black and white text. TV commercials are another form of traditional marketing that still have their place in your marketing plan. Commercials can bring your practice to life and show the friendly faces of your staff. Here are three commercials from cardiology practices that stand out. Butler Health System is a top-ranked cardiology provider. Their commercial tells the story of a man who was told he needed a heart transplant, which an invasive procedure. The team at Butler did a full evaluation and decided that wasn't what the man really needed. Instead, they cleared his blocked heart valves and gave him back his heart health without the invasive surgery. Throughout the commercial, we also see reviews on Healthgrades from other patients and learn about what makes Butler great. The ad features the doctors who worked with the man. They don’t look like actors and are in very regular doctor attire and environments, which brings the health system to life for the viewer. St. Vincent's uses interesting visuals to draw you into their commercial. It's a voice over that draws you in to learn what they are discussing. The ad talks about how it's important to treat the whole person and to see the entire picture of your overall health. For those who have struggled with heart health their whole lives and been told to adjust the way they live, this is great news. The ad works because of the messaging and the visuals it presents. This ad takes a different approach and simply touts the award that the hospital won for being the best heart health hospital in Georgia. We never hear from patients, and we don't see any of the doctors, and yet it's still a good commercial. What makes this ad great is that they take you outside the medical practice to tell you something good. The heart-shaped fireworks are a nice touch to draw you in to learn more. The ad works because the team has such a profound award to share information about. Because your website is the hub for your online presence, it's essential to make it look good and function phenomenally. To become best in class for cardiologist websites, let's review what makes a few of the best so great. Then we'll walk through some of the best mobile apps you can recommend to your clients to keep them healthy. Arizona Cardiology Group has a clean website that doesn’t try to do too much. Its simplicity makes it easy to find what you’re looking for as a patient or prospect. The homepage features a scrolling image and messaging with the top reasons to choose the cardiology practice and make an appointment. Below that there is a short description of the practice and then information on their accreditation and awards to show you that they are worthy of your business. Their location page is optimal for local SEO and has stunning photography of the outside of their office locations. You can familiarize yourself with the friendly faces of the practice’s doctors on their providers page. The services page gives an overview of all the things the practice offers, which also helps from an SEO perspective. Florida Heart and Vascular Care uses different types of media on its homepage to keep you engaged. From photography at the top to an interactive map in the middle and a video at the bottom, you won’t find a series of boring words on a page on their website. 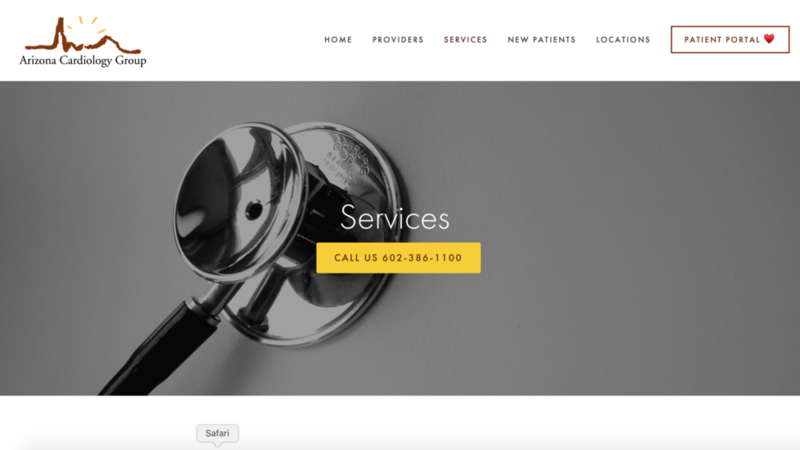 One of the best aspects of their website is the navigation bar with the crucial information you need: a phone number, patient portal, bill pay, and locations. Below that sits the main nav with further patient information. For local SEO, this website is excellent. Each location has a web page with information on the practice location and the doctors that practice there. The dedicated page for each location helps the practice rank in that area. 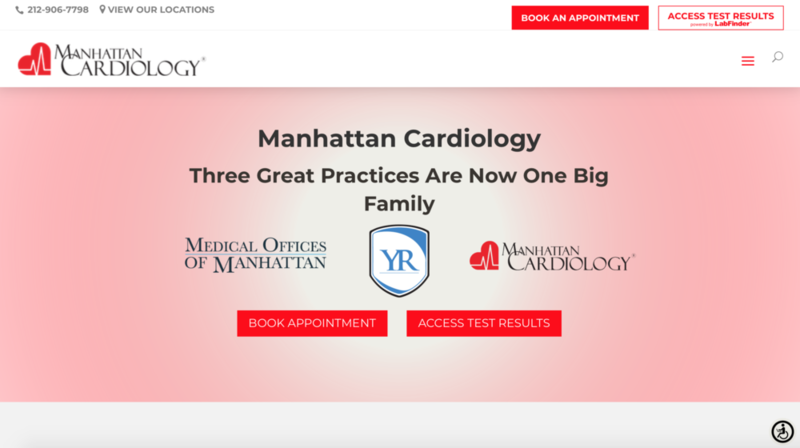 Manhattan Cardiology makes it easy to navigate their website by scrolling on the homepage. They list out the major sections of their site there with links to read more. One of the best parts of their website is the "why Manhattan Cardiology section." This part makes it clear why you should choose them over their competitors without you needing to visit every part of the website to figure out those points of differentiation. The team also lists out their reviews proudly on the homepage, which gives you even more reasons to choose them. The blog section of the website helps both patients and prospects take charge of their heart health with the information they need to stay healthy. Finally, one of the most significant aspects of choosing a doctor is whether or not they take your health insurance. Manhattan Cardiology lists out the major medical plans they accept so that you can be confident in your doctor selection. Cardiologists are now looking for mobile apps to recommend to their patients to manage their health. Here are some you can recommend. It’s only available for iPhone currently, but this app turns your smartphone into a blood pressure monitor so you can track this information at home. Blood pressure is a common reason patients visit a cardiologist and seeing charts and information about how activities and medications affect your blood pressure can help. You can get your heart rate while exercising to monitor your health and wellbeing. You can see your heart health over time from different workout types. All you have to do is hold your phone’s camera to your face or cover it with your index finger to get a reading. This app is an excellent companion for you when meeting with patients. It provides visuals of various parts of the heart and cardiovascular system so you can bring heart health to life. A 3D image of a beating heart can be what your patients need to see to understand their health better. All the best marketing and online presence mean nothing if your practice doesn't carry over that experience into your office. The best software and technology can help with this through an EHR or EMR that make for an exceptional patient experience. Let's review the top three pieces of software designed for cardiologists. Merge Cardio is a centralized, web-based software to house your patient information. The image housing and ability to share the images makes the platform ideal for treating cardiology patients. Additionally, the platform has outstanding automated billing to increase your efficiencies and decrease your practice operating costs. This EHR offers 16 reporting modules so you can see where your practice is at to grow it and understand your patient needs. You can also integrate your cardiology diagnostic equipment for digital viewing of scans and other information directly in the EHR. This reduces your document management and staff time. With a mobile application for most devices, your practice can easily provide outstanding patient care while documenting what you need to. With scheduling, billing, and options to offer patient reminders, drChrono is an all-in-one solution for your practice management needs. The patient portal allows you to stay in communication with your patients regularly and can give patients the opportunity to input data like daily blood pressure readings.